Starring Ann Sheridan, Kent Smith, Rosemary DeCamp, Bruce Bennett, Robert Alda, John Ridgely, Robert Arthur, Wanda Hendrix. Fairly high up in the ranks of "Loser Noir" is Vincent Sherman's Nora Prentiss, a 1947 Warners film clearly intended to do for Ann Sheridan what the Oscar-winning hit Mildred Pierce did for Joan Crawford. Once again the leading lady's name is the title but Sheridan's Prentiss isn't the strong character that Crawford played. The central figure of Nora Prentiss is actually Kent Smith's doctor, a strangely passive self-willed victim. Much of the appeal of Edgar Ulmer's classic Detour derives from wallowing in the self-pity of its hero Al Roberts. Nora Prentiss is a somewhat more upscale masochistic experience, a domestic nightmare about the destructiveness of sexual obsession. Illicit love affairs can go bad, but somebody would really need to put forth an effort to top the disaster pictured here. Straight-laced and unworldly Dr. Richard Talbot (Kent Smith of The Cat People) has a successful San Francisco practice. He feels rejected by Lucy, his wife of twenty years (Rosemary DeCamp). Too busy for romance, Lucy takes him for granted and is a regular joy-killer around their spirited teenaged children Gregory and Bonita (Robert Arthur of Ace in the Hole & Wanda Hendrix of Ride the Pink Horse). Then Talbot treats cabaret singer Nora Prentiss (Sheridan) for minor bruising received in a crosswalk accident. She flirts, he's charmed and soon they're soon seeing each other. The mutual bliss subsides when Nora discovers that Richard is married. She tries to break off the relationship, unsuccessfully. Talbot neglects his medical practice and ignores his family. Lucy becomes concerned but Richard's office partner Joel Merriam (Bruce Bennett) doesn't know what's going on. When Nora decides to stop the affair by relocating to New York, Talbot loses what little control he still has over his actions. He uses the sudden death of a patient as a means to swap identities. In New York he claims that he's simply waiting for a divorce, but his paranoid behavior convinces Nora that he's lying -- he dares not show his face in public. Al Roberts of Detour complains that he's constantly being tripped up by Fate with a capital "F". Richard Talbot is just a guy who throws his life away over an impossible amour fou -- turning his back on his profession, his family and his very identity. It's a pure case of Fatal Attraction. Nora Prentiss is also one of those noirs that balance on a pair of unlikely plot twists. While not as absurd as Paul Henreid's identity swap in Hollow Triumph, Talbot's wild plan pushes the story firmly into romantic delirium territory. The show has about six minutes of good humor as the alluring Prentiss teases her doctor-rescuer, wondering what makes such an uptight guy tick. From then on both lovers take a painful slide on the Doom Ride. Nora is devastated by Richard's near-insane admissions, and we have no choice but to watch her suffer. Viewers that wax nostalgic over failed romances will enjoy every humiliating step. Nora feels that life's big opportunities have passed her by, a familiar refrain for late 40s noir femmes Joan Bennett (Hollow Triumph) and Alice Faye (Fallen Angel). For a gal who knows the ropes, she's far too trusting of her new beau. She assumes that Richard is single and that he's telling her the truth. Even when Talbot balks at showing his face on the street, Nora lets him hide out for months before insisting on being told what's going on. Nora looks like the kind of woman who'd get wise in a matter of minutes -- she's in love, but she's not a total fool. Ann Sheridan was short-changed by the star system, and even in her best movies played support to the male leads on the Warner lot: Kings Row, City for Conquest. The actress's no-nonsense pragmatism is what keeps Nora Prentiss afloat. Sheridan is so appealing that Nora could be cutting throats and we'd still see her side of things; she makes her Other Woman character sympathetic even when the thriller aspects of the picture strain credibility. We know that the Doc is a goner right from the start. Richard has no defenses against the promise of a love affair with the spectacular Nora. He's had little experience with sordid life problems, and doesn't relate easily to people. Talbot is an anomaly for a film of this vintage, when doctors were commonly presented as noble paragons of wisdom and stability. He's so obsessively self destructive that he eventually loses our sympathy and respect. A perennial player of nice guys and conformist fools, Kent Smith subsequently played additional moral weaklings (The Damned Don't Cry!, The Fountainhead) and from there shifted into a career of stuffed shirts and hollow authority figures. The film eventually complicates its unlikely identity swap idea with another melodramatic gimmick, plastic surgery. Yet Nora Prentiss draws considerable power from its embrace of dark values -- there's not a hint of redemption for Dr. Talbot, even after he comes to his senses. But the show never falls back on a moral argument when handing out punishments. Richard Talbot dooms himself through his own character flaws. Seen in a mood of depression (as when one is unemployed), Nora Prentiss can be a crushing experience. This is a fine effort for director Vincent Sherman, who keeps control of the film's difficult moods while masking most of the holes in the plot. By the end most viewers have forgotten that the body of the story is a flashback recalled from a prison cell. Cameraman James Wong Howe lends a quiet realism to scenes in Talbot's office, with soft light coming in through the blinds, and helps the film build a growing feeling of claustrophobia as Talbot's life closes in around him. Sherman and Howe nail the bravura finish in which Dr. Talbot and Nora speak to each other through the grating of a prison visitor's window. Seen through two layers of steel mesh, his damaged face becomes an indistinct mass of shadows: it's as if Talbot were already disintegrating into a poetic nothingness, willing himself not to exist. If you're fond of noirs that play the Doom Card at the fade-out, Nora Prentiss is just the ticket. 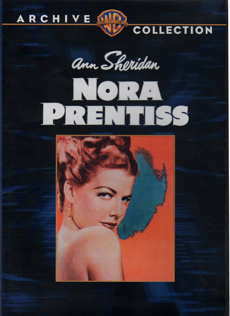 The Warner Archives Collection DVD-R of Nora Prentiss is a good transfer but not a new one. The expected flaws are present. A full restoration would cure the slight unsteadiness in a couple of scenes in this 62 year-old movie. Just the same, the transfer still conveys the range of photographic moods created by James Wong Howe. Franz Waxman's score comes across very well on the audio track, as does Ann Sheridan's song "Who Cares What People Say?" I'm not sure that it's Sheridan's voice we hear, but it certainly sounds like her. The original trailer is included, a hyped attempt to make Nora Prentiss into a whispered buzzword: "She's the kind of woman who happens to a man once .... once too often!" The photo on the back of the box appears to be from the wrong movie ... it shows Ann Sheridan sitting at a table with (I'm fairly certain) Eve Arden. 1. Speaking of locations, Talbot passes The Cliff House restaurant on the way to ditch the body of his unlucky patient. The landmark Cliff House is still there. It used to be next to an enormous bathhouse complex. That establishment eventually became the skating rink where begins the terrific high-speed auto chase that closes out Don Siegel's The Lineup (a DVD is coming soon from Sony). The chase roughly follows the doctor's route to work: East past the Golden Gate Bridge, and from there to downtown San Francisco. 2. A guilty guy in hiding losing his marbles and falling prey to his own imagination is the subject matter of what is perhaps W. Lee Wilder's only really good movie, 1947's The Pretender. Albert Dekker jealously hires a mobster to kill his girlfriend's husband to-be, only to suddenly marry her himself -- and realize that he's set himself up for a kill that he can't call off. Dekker holes up in an attic room, quietly going stark raving mad. W. Lee Wilder is the underachieving, virtually unknown filmmaker brother of the celebrated Billy.